In his new budget proposal, Ohio Republican Gov. John Kasich calls for extending a generous 21 percent cut in state income taxes. The measure was originally part of a sweeping 2005 tax overhaul that abolished the state corporate income tax and phased out a business property tax. The tax cuts were supposed to stimulate Ohio’s economy and create jobs. But that never happened once the economy tanked. Instead, the changes ended up costing Ohio more than $2 billion a year in lost tax revenue; money that would go a long way toward closing the state’s $8 billion budget gap for fiscal year 2012. “At least half of our current budget problem is a direct result of the tax changes we made in 2005. A lot of people don’t want to hear that, but that’s the reality. Much of our pain is self-inflicted,” said Zach Schiller, research director at Policy Matters Ohio, a liberal government-research group in Cleveland. Schiller’s lament is by no means unique. Across the country, taxpayers jarred by cuts to government jobs and services are reassessing the risks and costs of a variety of tax reductions, exemptions and credits, and the ideology that drives them. States cut taxes in hopes of spurring economic growth, but in state after state, it hasn’t worked. There’s no question that mammoth state budget problems resulted largely from falling tax revenues, rising costs and greater demand for state services during the recession. But questionable tax reductions at the state and local level made the budget gaps larger — and resulting spending cuts deeper — than they otherwise would have been in many states. In Texas, which faces a $27 billion budget deficit over the next two years, about one-third of the shortage stems from a 2006 property tax reduction that was linked to an underperforming business tax. In Louisiana, lawmakers essentially passed the largest tax cut in state history by rolling back an income-tax hike for high earners in 2007 and again in 2008. Without those tax reductions, Louisiana wouldn’t have had a budget deficit in fiscal year 2010, the 2011 deficit would’ve been 50 percent less and the 2012 deficit of $1.6 billion would be reduced by about one-third, said Edward Ashworth, the director of the Louisiana Budget Project, a watchdog group. These and similar budget problems nationwide are symptoms of a larger condition, said Timothy J. Bartik, senior economist at the Upjohn Institute for Employment Research in Kalamazoo, Mich.
“If state and local taxes were at the same percentage of state personal income as they were 40 years ago, you wouldn’t have all these budgetary problems,” Bartik said. Before California’s Proposition 13 triggered a nationwide tax-cut revolt in the late 1970s, state and local taxes accounted for nearly 13 percent of personal income in 1972, Bartik said. By 2007, it was 11 percent. State corporate income taxes have fallen as well. Once nearly 10 percent of all state tax revenue in the late ’70s, they accounted for only 5.4 percent in 2010. “It’s a dying tax, killed off by thousands of credits, deductions, abatements and incentive packages,” according to 2010 congressional testimony by Joseph Henchman, the director of state projects at the Tax Foundation, a conservative tax-research center. Even now, as states struggle to provide basic services and ponder job cuts that threaten their economic recovery, at least seven governors in states with budget deficits have called for or enacted large tax reductions, mainly for businesses. Five are newly elected Republicans in Florida, Maine, Michigan, New Jersey and Wisconsin. The others are Republican Jan Brewer of Arizona and Democrat Beverly Perdue of North Carolina. Their willingness to forgo needed tax revenue is hard to fathom, as states face a collective $125 billion budget shortfall for the coming fiscal year, said Jon Shure, the deputy director of the State Fiscal Project at the Center on Budget and Policy Priorities, a respected liberal research institute in Washington. “To be cutting taxes when you’re short of revenue is like saying you could run faster if you cut off your foot,” Shure said. Tax Foundation President Scott Hodge said the governors were simply trying to improve their states’ business climates by lowering the tax burden. “They’re trying to increase their market share and their attractiveness to business,” Hodge said. “And also, more importantly, they’re trying to prevent the attrition of business and investment to other states” that have lower tax rates. Republican lawmakers and pro-business groups have long maintained that tax cuts help stimulate economic activity, while keeping businesses and wealthy individuals from leaving the state for lower taxes elsewhere. They also argue that business and personal spending increases after tax reductions, broadening the base to be taxed at the lower rate, which partly offsets the lost tax revenue. So calls to balance lean state budgets through spending cuts as well as modest, revenue-boosting tax hikes haven’t resonated with Republican governors, who see tax relief as the key to reversing job losses in the Great Recession. “Raising Ohio’s taxes even higher won’t bring those jobs back. Reducing costs so we can start reducing taxes is the key to our revival,” said Rob Nichols, Kasich’s press secretary. Extending the state’s personal income-tax cut will cost $800 million over two years. Business tax reductions may be overrated as an economic stimulus because they’re so low on the totem pole of expenses. For most businesses, the cost of labor is probably 15 times the cost of all state and local taxes, said Bartik of the Upjohn Institute. In his own research, Bartik found that a 10 percent across-the-board cut in state and local business taxes might boost employment by 2 percent, but it could take up to 20 years. Compounding Ohio’s budget woes are 128 state tax exemptions, credits and deductions that drain more than $7 billion a year in would-be revenue. These loopholes make Ohio miss out on one of every four dollars it would otherwise collect in taxes, said Schiller of Policy Matters Ohio. In Missouri, business and individual tax credits cost the state $521.5 million in fiscal year 2010, compared with $103 million in 1998, according to a state report. Louisiana’s 441 individual and corporate tax breaks cost the state $7.1 billion last year. That nearly matches the $7.7 billion that all state and local taxes brought in. Some of the breaks provide sales-tax exemptions on groceries, prescription drugs and residential utilities that saved Louisiana taxpayers $717 million last year. But another allows Louisiana companies to keep 1 percent of the state sales taxes they collect — about $34 million statewide — just for filing their tax returns on time. Hodge, a conservative, said that closing loopholes and exemptions was less harmful to the economy than tax increases were. The Tax Foundation supports scaling back or closing tax loopholes, while lowering tax rates across the board. “My argument to state lawmakers is that lower rates for everybody are better than tax incentives for some,” Hodge said. That incentive-free philosophy was behind Michigan Gov. Rick Snyder’s call for a flat 6 percent corporate income tax to replace the current business tax system. But Snyder’s flat tax amounts to a $1.5 billion tax cut for businesses, paid for in part by education cuts, personal income tax increases and taxing public and private pensions. “We think that’s the way to rebuild our state, and to get it on a path toward economic prosperity,” Snyder’s top economic development official, Michael Finney, said during a recent trip to Washington. History suggests otherwise, however. After the nation recovered from the 1990-91 recession, 43 states made sizable tax cuts from 1994 to 2001 as the economy surged. Twenty-eight states, in fact, reduced their unemployment insurance payroll taxes after 1995. But states that cut taxes the most ended up with the largest budget shortfalls and higher job losses when the economy slowed again in 2001, according to research by the Center on Budget and Policy Priorities. To be sure, states have made bad budget decisions on the spending side as well, said Robert Ward, deputy director of The Nelson A. Rockefeller Institute of Government, a state-government research center at the State University of New York at Albany. Part of the problem is that the public wants everything but doesn’t want to pay for anything, Ward said. Garbage, fire, nuclear bomb explosion—these are possible solutions to stop the oil spill in the Gulf of Mexico? The Daily Beast looks at 11 of the most out-there ideas proposed so far. Is the fact that it worked in Norway a good reason to give peat moss a try? The hyper-absorbent moss has been used to generate moisture, and the panhandle county of Escambia, Florida, has proposed dropping it into the Gulf. Kallak Torvstrøfabrikk, a Norwegian company, developed a series of products based on peat moss to be used in oil spills, after it was used to clean up a spill off the coast of Norway in 2009. BP’s engineers have suggested a giant underwater cone, but one amateur engineer has a different solution: to create a permeable cone placed over the leak. By creating the malleable cone, Rick Lewis hopes it reduces pressure in the deep sea environment. In this model, some of the oil will leak out from the structure. State and local officials in Louisiana started dropping sand bags in the water, and U.S. National Guard teams in Alabama arrived on Dauphin Island, a tiny barrier island, to build a sand berm, intended to back the oil from moving any closer to the mainland. Don’t laugh: BP’s COO proposed creating a chamber over the leak and shooting garbage into the space to plug it. Plans to create a four-story dome to cap the leak fell apart after crystals formed when the gas combined with water, so officials hope the smaller chamber filled with garbage will be a stronger structure. Newsweek also has a post up highlighting some of BP’s crazier schemes. Norway offered one solution; here’s another from Russia . Komsomolskaya Pravda, a major Russian daily, suggests an old Soviet trick: small nuclear blasts. According to the newspaper, it’s such a useful solution that it was used five times by one company in the Soviet Union. A scientist from Indiana University-Purdue University Indianapolis proposes spraying these soap-like substances, which would work like dishwashing liquid. Dr. Gabriel Filippelli said surfactants disperse the oil in the water and work as a nutrient for the bacteria. The much-publicized hair solution has been proposed by a California-based ecological charity. Philippine officials initially came up with the idea in 2006 but backed out at the last minute. Instead, rice stalks were attached to bamboo poles and used as makeshift brooms. Green Energy Recourses Inc. offered 100,000 tons of wood chips for containment. The company proposed placing woodchips inside a containment boom and through honeycomb structures to absorb the oil as well as collect it. One difference from peat moss: It won’t sink to the bottom; it would need to be collected from the surface. But the woodchips could help generate electricity at power stations. Stop gas with fire? It’s not the most extreme idea out there. BP conducted five controlled burns last week to try to burn the oil off. The Florida panhandle town of Walton has already started spraying hay into the water if it arrives at the shoreline. A popular YouTube video has surfaced this week showing viewers how to use hay to disperse oil. Another solution from BP: Remotely operated vehicles (ROVs) would be used to tap into the riser and pump oil out of it and onto the surface through a pipe. It’s admittedly more dangerous, as it drills another hole into the rig. Correction: This story originally referred to surfactants as suracants. When my wife and I decided yesterday that we were going out for dinner and her preference leaned toward “What ever you want…I don’t want to decide.” I decided on SNACKBAR in Oxford, MS. This place embodies everything that I like in a restaurant. Good food, good music, good atmosphere, and raw shell fish. As the 1st glass of wine, first 1/2 dozen oysters, and truffle/parmesean frites were ordered the discussion began over what the “meal” would be. This act usually involves multiple partial menu readings, wine sips, casual glances around to see what others are eating, and another reading of the menu all while talking about the day and upcoming plans. It’s mental juggling 15 plus topics while the most important aspect of the WHOLE visit is dancing around in your head. WHAT AM I GOING TO HAVE AS MY MAIN COURSE? I have eaten many things at this restaurant. However, one dish…one beautiful dish that initially was the most daunting thing that this southern boy has ever come across, stands out as what I mentally associate to this restaurant. This culinary device has escaped my for 33 years, until I read it’s description on Snackbar’s menu. As the horror and confusion made its way through my brain, I slowly realized that there was a caveat to my fear: YOU HAVE TO EAT THIS. To the shock of my wife, I did. I loved it. As in the Star Wars movies, the Death Star is the ultimate icon in the movies…It’s purpose is to shock you and give you a sense of overwhelming awe. Yes, I know it blows up, but that isn’t my point. My point is this. No matter what this restaurant does in the future, no matter how they change the menu, the decor, the wait staff…The Scotch Egg will float over that place like the Death Star pulling me with its tractor beam back again. 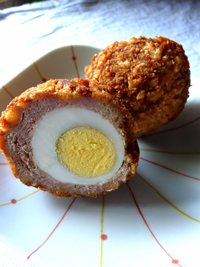 I was powerless…Scotch Egg it was. GREAT CHOICE. It scared me…it pleased me…it made me happy. Just like good food is supposed to. Your homework is to eat one and THANK ME. Shell the hard boiled eggs. Press the sausage meat into meat squares on a floured board. Wrap the eggs in the sausage meat, making sure this is completely sealed without any air space on cracks. Brush with the beaten egg. Roll in bread crumbs. Heat oil and test it by placing a piece of stale bread with oil for 1 minute and it turns golden brown; 1 1/2 minutes if using fat. Put in the scotch eggs. Fry steadily for approximately 5 to 8 minutes until crisp and golden brown. Lift out, drain on crumpled paper and serve hot or cold. It is possible to bake these in the oven. Allow approximately 20 to 25 minutes in a 350 degree oven.